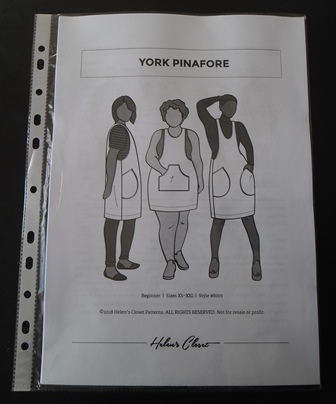 To be honest when the York Pinafore by Helen’s Closet first came out I wasn’t one of the many people who instantly wanted to make it. After seeing many people on Instagram make it I became a convert and purchased the pattern. After reading the pattern it did scare me a little, it is designed for a B cup and I am clearly not. There are instructions on how to adjust the upper front bodice to accommodate for the larger busts but I was a bit confused as my cup size varies in different bras. In the end I just took the plunge and tried out the pattern adding 2″ to the bodice and hoped for the best. After I traced out the pattern onto trace and toile I did actually pin the pattern together to check the fit, it seemed ok so I pinned the pattern to my fabric and cut away. Ok so I was a little naughty and didn’t follow full instructions. I skipped the stay stitching bit around the neckline/armholes and made my pocket a little differently. I think the term is bagging it out – I cut the pocket a double thickness with right sides facing and stitched around the outside leaving a turning gap at the bottom then turned it out. This way I didn’t need to attach bias binding to the curves on the pocket, I just did some top stitching on them before stitching to pocket to the front. I also raised the pocket up higher than the pattern suggests. To bind the edges of the neck and armholes I made my own continuous binding instead of cotton tape. I followed the tutorial from Missouri Star Quilt company. I marked out my strips 1.75″ wide. 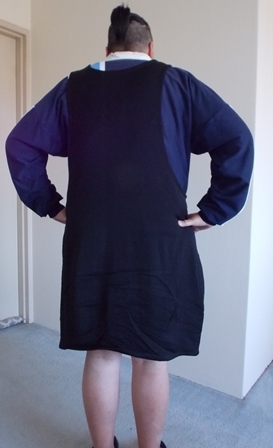 I had heaps of binding left over so I used it on the hem at bottom too. I didn’t want to lose much length at the bottom so this was a good solution. Ok so it only ticks half the points. It is certainly comfortable although a bit short, the style is classic I think. As for creative/quirky I think that point is a bit iffy, I certainly like the pocket which is what drew me to this pattern as it is very useful and holds a lot. The fabric I used was some suiting fabric I brought from Pitt Trading when it was on sale for about $5 or $10 per metre and is a synthetic but as it isn’t directly close fitting to the skin I can easily wear it. 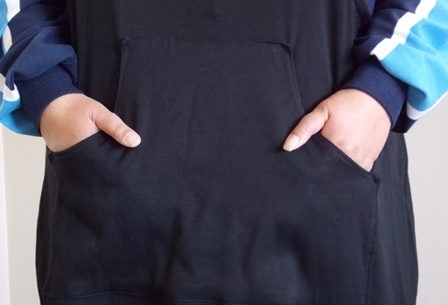 You have 2 options with this pattern, I chose view B which is a bit shorter and has the kangaroo pocket. 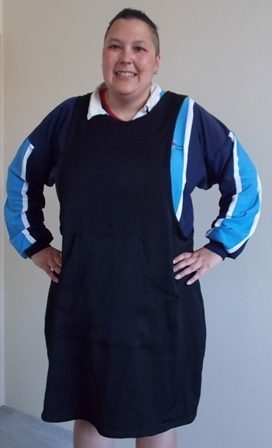 I have since made a 2nd pinafore with even more plans to make more so I am glad I decided to step outside my comfort zone and try the pattern. Sewing wise it was fairly quick to make, binding all the edges takes the most time but it isn’t tricky to do.